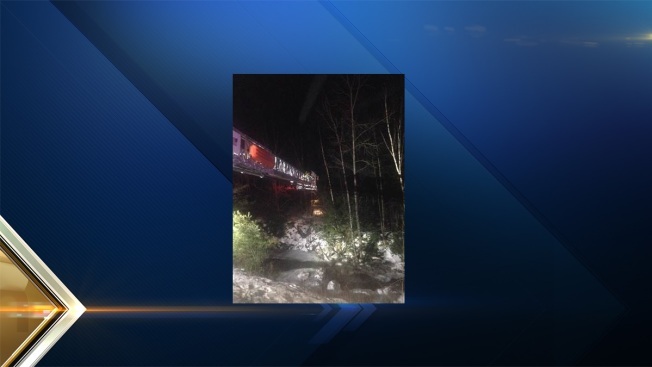 Hanover Fire Department extends a ladder to retrieve a New Hampshire man found unconscious in the woods 10 hours after his car veered off I-89. New Hampshire State Police and local K-9 units located a New Hampshire man who was found unconscious, suffering from hypothermia and curled up in fetal position nearly 10 hours after he wandered away from a car accident Friday night. James Borneman, 49, of Springfield, was taken to Dartmouth Hitchcock Hospital where he was treated for serious injuries and exposure to the elements, according to state police. Police said the 2003 Buick Rendezvous Borneman was driving veered out of the southbound lane of I-89 in Enfield at 6:30 p.m., struck a guardrail and rolled over several times. When state police arrived on the scene, they discovered Borneman wasn't with the car. Lebanon police officers used search dogs and found a sporadic trail of footprints and some blood, which led nearly a mile away from the accident into nearby woods and across a fast-moving brook. State and local police found Borneman at about 4:30 a.m. The Hanover Fire Department provided immediate medical care. Lebanon and Hanover police departments assisted with the investigation.